The Basic coil is a good innerspring for occasional use or for bedrooms, home office, living room and dens.. . It folds well and is easy to use. 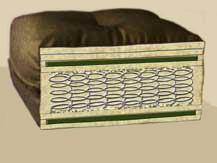 It is one of our popular innerspring mattresses.